The Roman Deluxe is similar to the Patrol Deluxe, only a little smaller and with a single center pole. The waterproof groundsheet is sewn in to fixed size walls. Twin doors on either end of the tent have large no-see-um mesh backed windows on both sides for cross ventilation and visibility. The unique shape is both wind resistant and offers ample interior space for 2 people and gear. Measuring 4,4m long x 3m wide (13ft x 11.4ft) with 13.2m² (142ft²) of floor space and a 1.75m (5.7ft) center pole height. Made of breathable and weatherproof cotton canvas. The Roman Deluxe is designed to fit up 8 campers on sleeping pads. The Roman Deluxe is a popular cabin tent amongst preppers, survivalists, and wilderness guides. A unique design that stood the test of time doesn’t need too much introduction. The Roman Deluxe offers a lot of space and can be equipped with an inner tent that turns half of the tent into a secluded area (sold separately). It has been a first choice for many families or adventurous campers looking to create a cool and comfy basecamp. 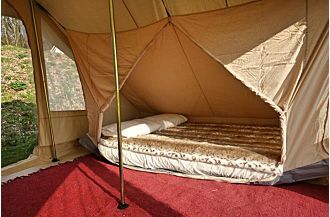 Door can on each end of the tent with a screen window on each side for a total of 4 windows. The doors and windows both can be rolled up and secured with loop fasteners and provide an ample ventilation and air flow when needed. The Roman Deluxe Groundsheet (540 gr/m² or 15.93 oz/yd²) is made of durable, thermally welded, PVC and is sewn directly onto the tent wall. Completely water and vapor impenetrable, the ‘bathtub style’ floor rises 4 inches high to keep you dry even in standing water. Double stitching attaches the groundsheet to the tent keeping it simple yet durable. Because the groundsheet is attached to the tent the walls on the Deluxe cannot be rolled up. To make assembly quick and easy of the tent all poles are spring loaded. All are made with durable nickel plated steel 25mm (1”) in diameter. Central poles are provided with a welded lanyard ring to hang a chandelier or camp lantern from. The spring loaded poles form a sturdy structure that withstands the harshest conditions. Our Classic Canvas (320 gr/m² or 9.5 oz/yd²) on the Ultimate, Deluxe, and Standard series is the perfect balance of performance and breathability. Our proprietary treatment enhances the natural water resistance of canvas, and is excellent protection for moderate climates and casual use. 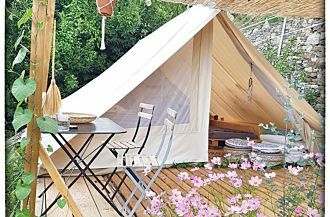 Repairable and retreatable, a properly maintained Classic Canvas tent can last for years. The stakes and pegs are designed for easy insertion and removal from average earth, like grass or forest floor. The tent pegs for the guy lines are curved like a shovel to securely hold tension in the ground, and have a lip at the top to prevent the guy line from slipping off. The pegs for the floor are round to slip through the loops attached to the bottom of the side wall, have a hook shaped top and hold the floor in place. All standard stakes and pegs measure 22cm (8.6 inches). An inner tent for the Roman Deluxe is available in the Sibley Accessories category. It’s the only cabin tent compatible with an inner tent…which is why we grouped it in with the Sibley’s even though the Roman Deluxe is more of a guide tent than a bell tent. Our Roman Deluxe tents come with 3mm guy ropes that will need to be tied on before your first pitch. Plastic tensioners prevent edges from cutting into the guy lines and prolong the life of your tent. Check out our assembly instructions in the Specifications tab to get a feel for the initial set up process. All CanvasCamp tents are easily adaptable for use with a wood burning tent stove. Proper stove placement is dependent on stove size, tent size, flu exit style, desired temperature, and the environment you intend to camp in. One size fits all, pre-installed stove jacks fail to provide customers with the level of customization necessary to achieve ideal stove placement and maximum utility. To ensure proper placement and ideal efficiency, CanvasCamp offers modular stove jacks (sold separately) that can be easily installed in any cotton canvas tent in just a few minutes. Stove jacks are available in a variety of shapes and sizes so you can choose the jack that fits your tent and stove perfectly.